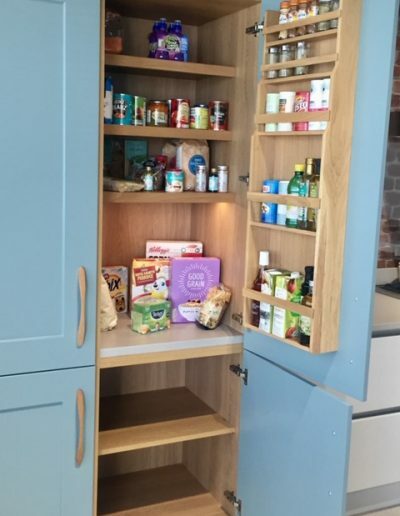 If you’ve ever met me or any of my team, chances are we’ve talked about a larder within the first few minutes of meeting. We’re so passionate about storage that all of the kitchens we’ve fitted in the last two years have included a larder in their layout! 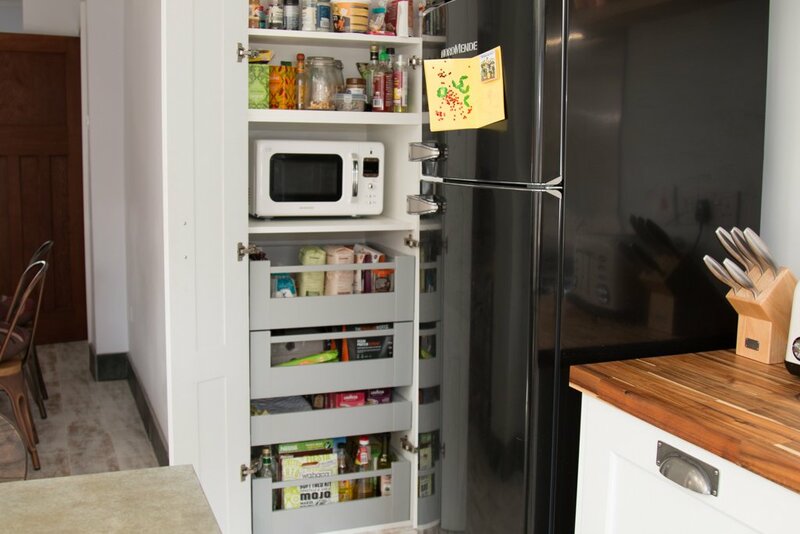 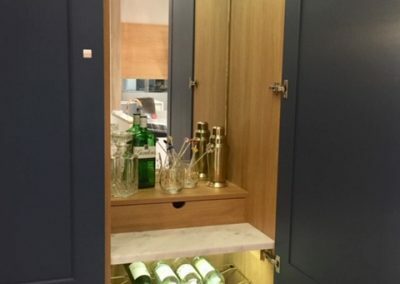 The beauty of clever design integrating things like a Blum Space Towers, is that no matter what size of space you have to work with, a tall cabinet with pull-out drawers maximises every square millimetre of space. 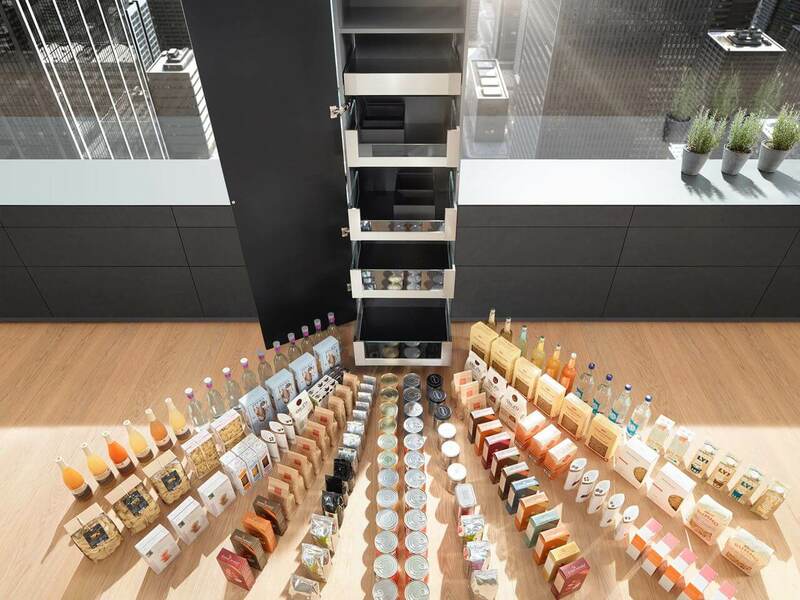 Designed by Austrian company Blum, a ‘Space Tower’ is simply a set of heavy duty internal soft-close drawers. 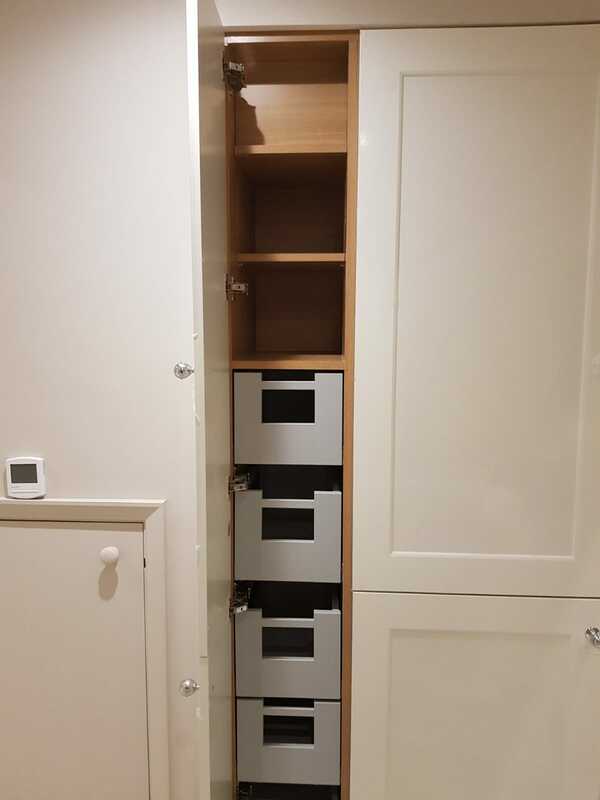 Each drawer is designed to hold 70KG (154lbs) in weight, and is guaranteed for life. 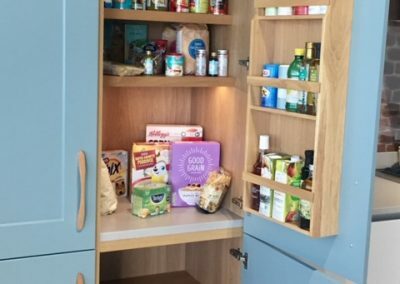 As you can see, a 600mm wide cabinet would hold this much food inside it’s drawers alone! 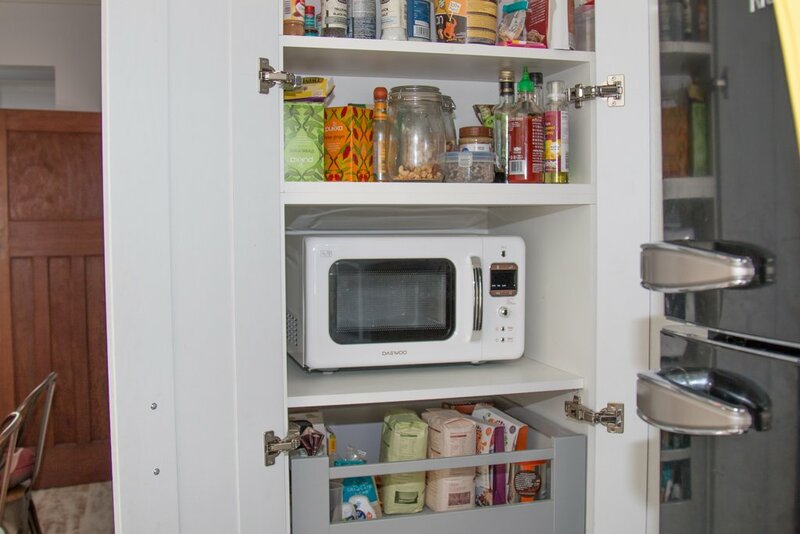 Just think of the amount of wall cabinets that reduces. 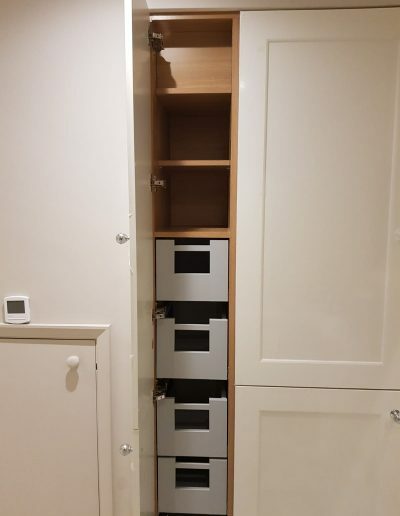 Better still, because each drawer is telescopic, you can see everything that would ordinarily be at the back of your cabinet. 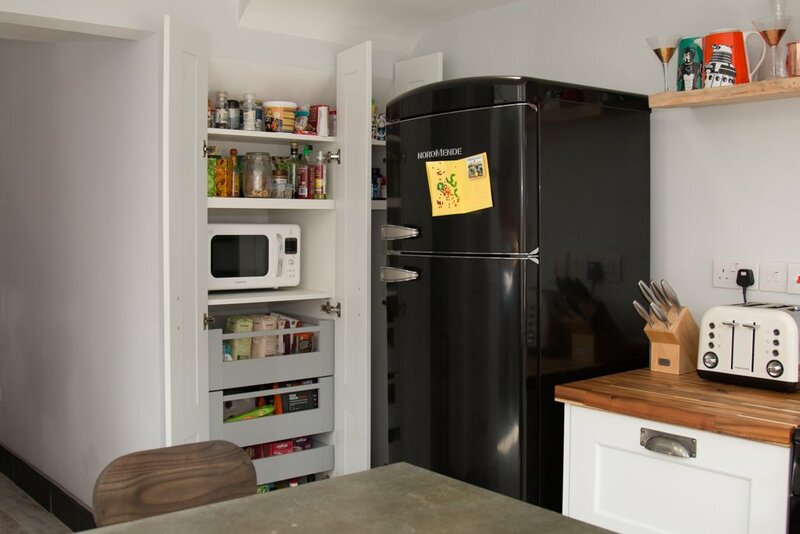 This means much less waste and easier date rotation. 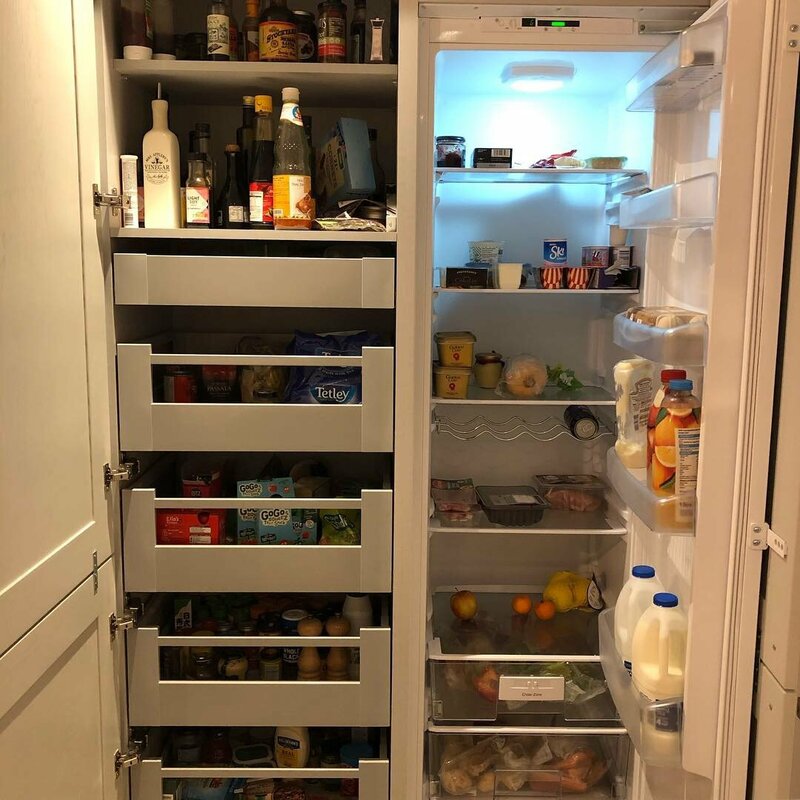 Click any image below to see more. 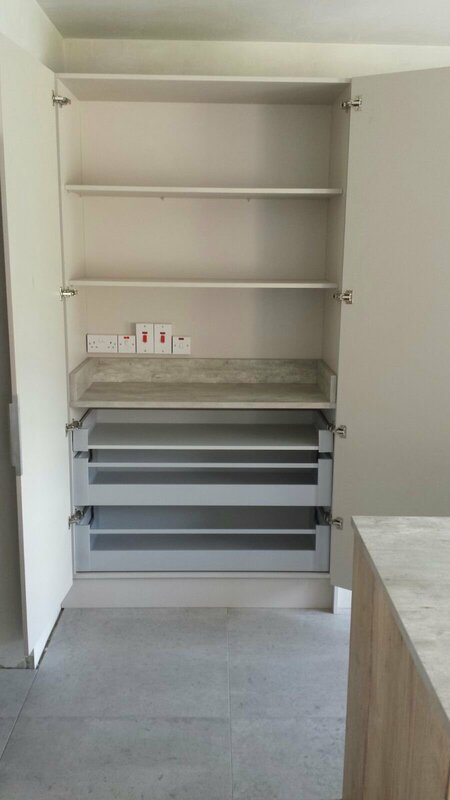 A Space Tower is available in any size from the smallest (above right) at 200mm wide, and up to 1200mm wide making the most of any available space. 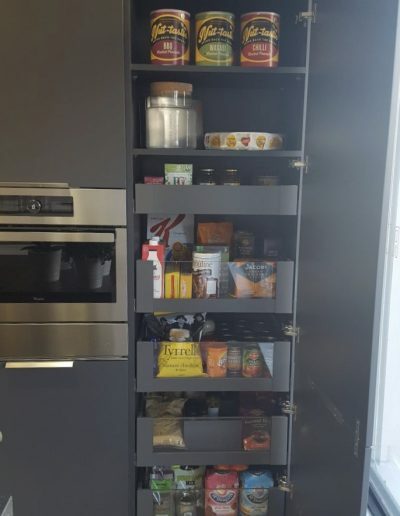 We’re so passionate about utilising every millimetre, that we often add larders in the tightest of spaces. This compact kitchen in Bangor didn’t have the space for a larder in the main footprint of their kitchen, so we had to get creative! 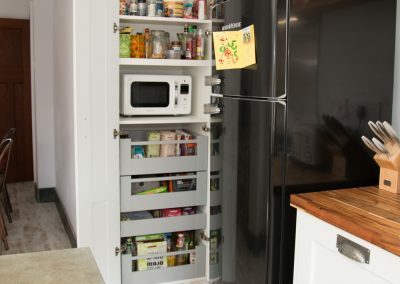 The compact footprint left little space for tall storage, however the under stairs area was a void space storing just a mop and ironing board. 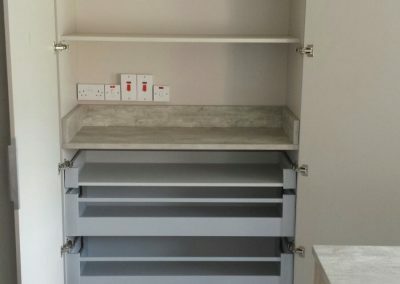 Everything we design is bespoke, so an efficient under stairs cabinet was created. 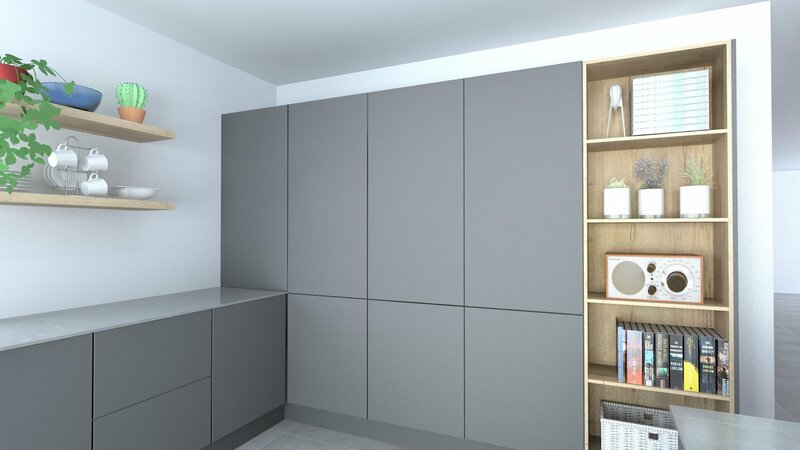 Out of shot is a slim compartment for the ironing board, mop and cordless Dyson (right hand door). 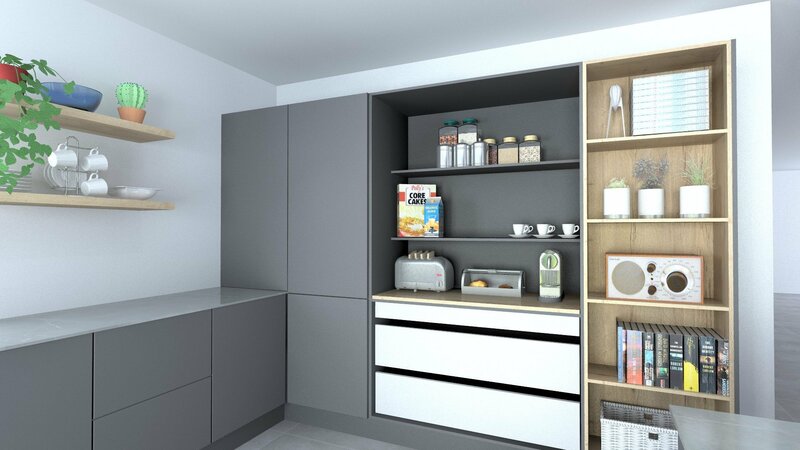 The left hand has been designed to accomodate the microwave (saving worktop space) and a Space Tower for all ambinet food storage. 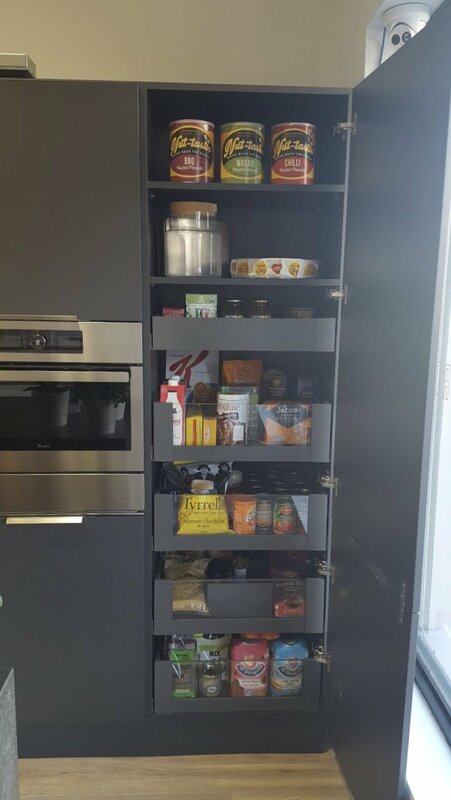 The result, a space that is maximised and easy to access. 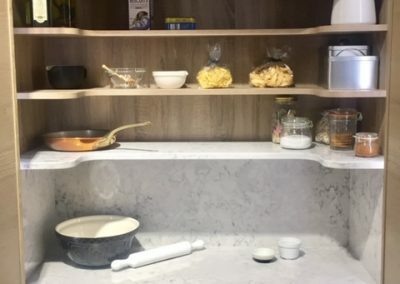 Click any of the below images to see more. 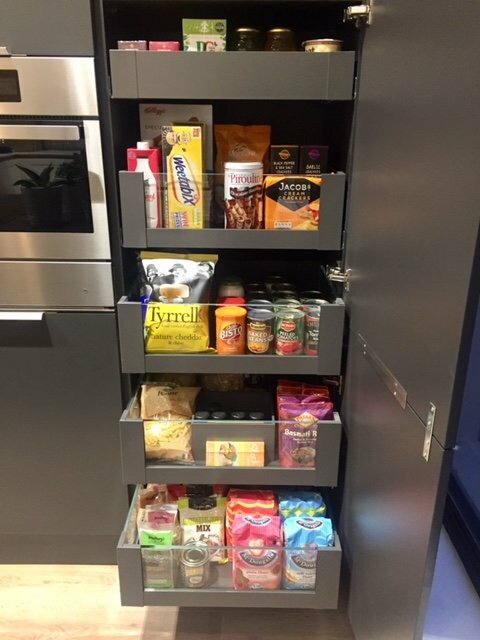 As well as functional slim larders, we also love wide and spacious larders that give us space to hide worktop clutter! 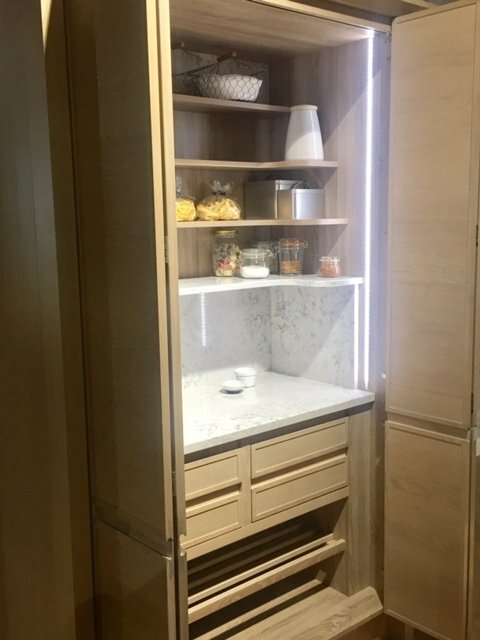 Referred to as ‘coffee docks, or breakfast hubs’ a 1000-1200mm cabinet is perfect to store kettles, toasters, coffee machines and microwaves. 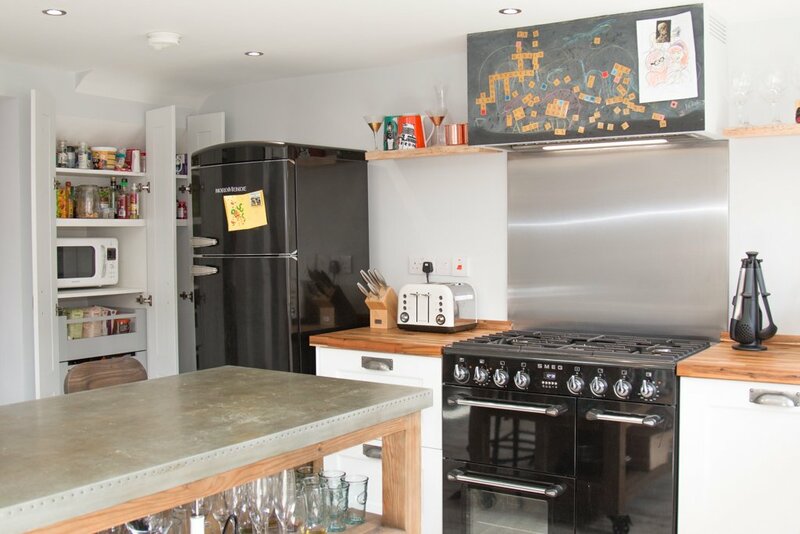 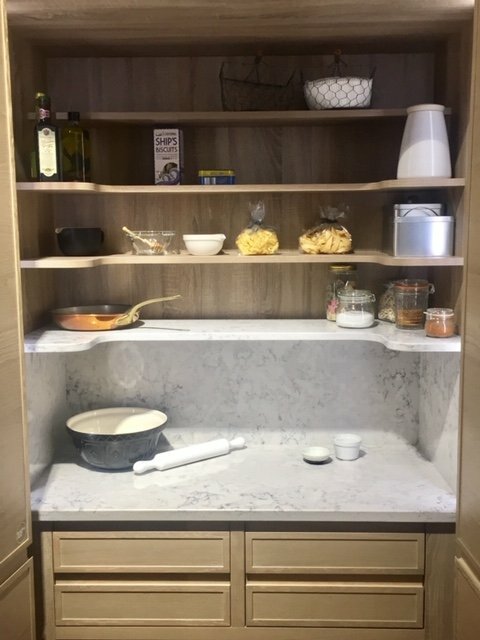 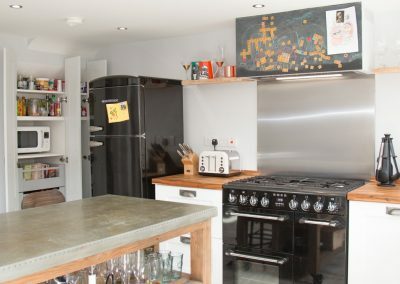 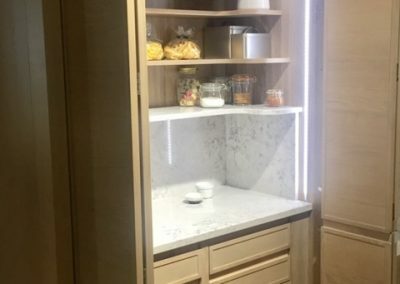 Typically fitted with worktop, and electricity inside these types of larders are perfect to hide away small appliances that can still be used without removing from the cabinet. 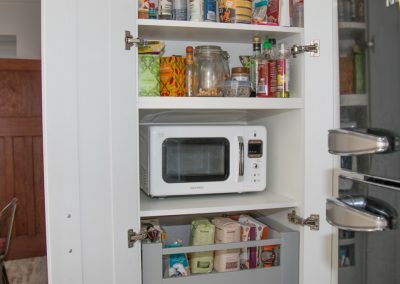 Our clients often use these in the morning, shutting the doors on any mess and clutter if there isn’t time before work! 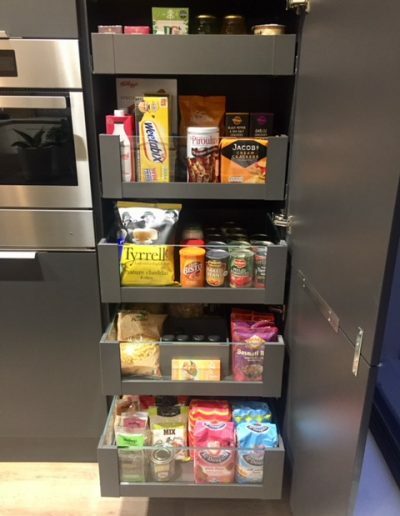 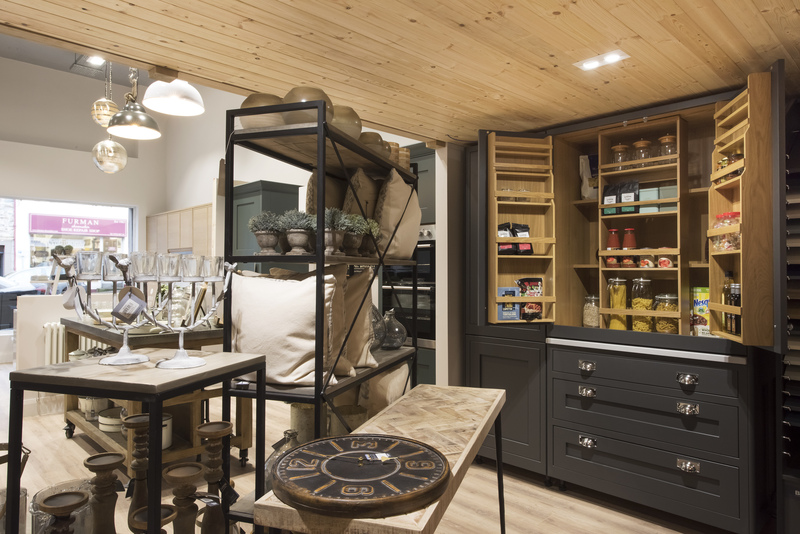 Of course these style of larders aren’t just for the messy or busy, they are often designed for super organised people, baking enthusiasts and even as drinks cabinets! 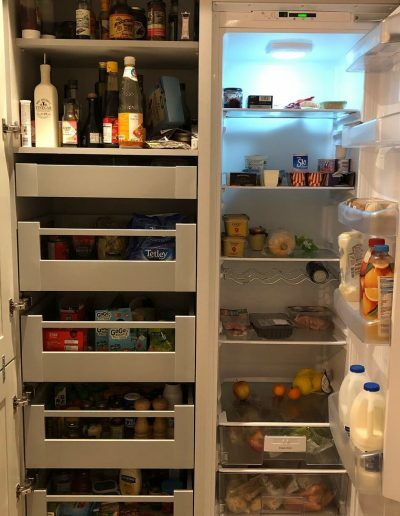 Click any image below to see more. 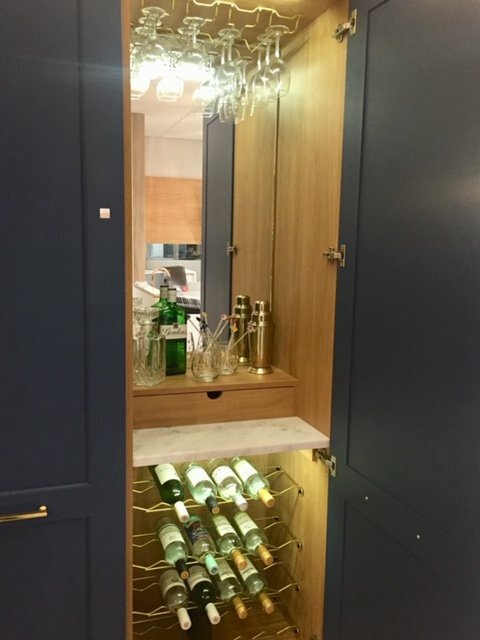 Everything we do is bespoke, and designed with you in mind. 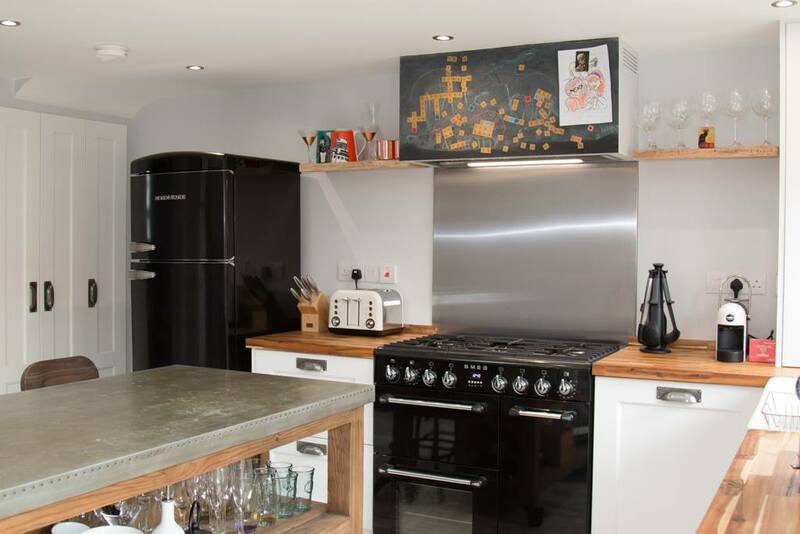 What would you like to see in your new kitchen? 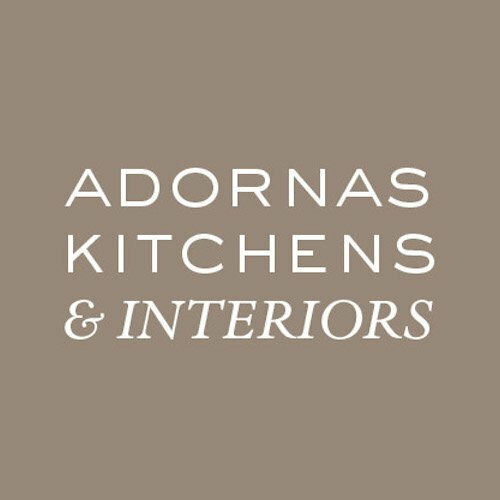 Why not get in touch to find out more?